The game uses artificial putting surfaces such as carpet, artificial turf and/or concrete, a geometric layout often requiring non-traditional putting lines such as bank shots, and artificial obstacles such as tunnels/tubes, ramps, concrete/metal/fiberglass forms, and moving obstacles such as windmills. When miniature golf retains many of these characteristics but without the use of any props or obstacles, it is purely a mini version of its parent game. Resort towns such as Myrtle Beach, South Carolina; Branson, Missouri; Pigeon Forge, Tennessee; and Wisconsin Dells, Wisconsin are known for their numerous minigolf courses. A miniature golf course in Cape May, New Jersey. While the international sports organization World Minigolf Sport Federation (WMF) prefers to use the name "minigolf", the general public in different countries has also many other names for the game: miniature golf, mini-golf, midget golf, goofy golf, shorties, extreme golf, crazy golf, adventure golf, mini-putt, putter golf and so on. The name Putt-Putt is the trademark of an American company that builds and franchises miniature golf courses in addition to other family-oriented entertainment, and the term "putt-putt" is sometimes used colloquially to refer to the game itself. The term "minigolf" was formerly a registered trademark of a Swedish company that built its own patented type of minigolf courses. The first standardized minigolf courses to enter commercial mass-production were the Thistle Dhu ("This'll Do") course 1916 in Pinehurst, North Carolina, and the 1927 Tom Thumb patent of Garnet Carter from Lookout Mountain, Tennessee. Thomas McCullough Fairbairn, a golf fanatic, revolutionized the game in 1922 with his formulation of a suitable artificial green—a mixture of cottonseed hulls, sand, oil, and dye. With this discovery, miniature golf became accessible everywhere; by the late 1920s there were over 150 rooftop courses in New York City alone, and tens of thousands across the United States. This American minigolf boom of early 20th century came to an end during the economic depression in the late 1930s. Nearly all minigolf courses in the United States were closed and demolished before the end of the 1930s. A rare surviving example from this period is the Parkside Whispering Pines Miniature Golf Course located near Rochester, New York, and listed on the National Register of Historic Places in 2002. One of the first documented minigolf courses in mainland Europe was built in 1926 by Fr. Schröder in Hamburg, Germany. Mr. Schröder had been inspired by his visit to the United States, where he had seen minigolf courses spreading across the country. The earliest documented minigolf competitions were played in the United States. The first National Tom Thumb Open minigolf tournament was arranged in 1930, with a total cash purse $10,000 (the top prize being $2,000). Qualification play-offs were played in all of the 48 states, and the final competition on Lookout Mountain, Chattanooga, Tennessee attracted over 200 players representing thirty states. After the Depression ten years later, minigolf died out as a competition sport in America, and has begun to recover only during the most recent decades. The American minigolf sport boom of the 1930s inspired many European countries, and the sport of minigolf lived on in Europe even after the American game fell into Depression. They then went on to football. Golfer golfing at Monster Mini Golf, an indoor glow in the dark mini golf course. Impressed by the quality of the courses, many customers asked if the Taylors would build a course for them. By the early 1940s, Joe and Bob formed Taylor Brothers, and were in the business of building miniature golf courses and supplying obstacles to the industry. During both the Korean and Vietnam Wars, many a G.I. played on a Taylor Brothers prefabricated course that the U.S. Military had contracted to be built and shipped overseas. In the 1950s, Don Clayton invented the Putt-Putt brand with a focus on treating mini-golf seriously, emphasizing skill and player improvement. Most of the Putt Putt routes were 2-par holes involving ramps or angled blocks that could be mastered in one go through practice. By the late 50s almost all supply catalogs carried Taylor Brothers' obstacles. In 1961 Bob Taylor, Don Clayton of Putt-Putt, and Frank Abramoff of Arnold Palmer Miniature Golf organized the first miniature golf association known as NAPCOMS (or the "National Association of Putting Course Operators, Manufacturers, and Suppliers"). Their first meeting was held in New York City. Though this organization only lasted a few years it was the first attempt to bring miniature golf operators together to promote miniature golf. In 1955, Lomma Golf, Inc., founded by Al Lomma and his brother Ralph Lomma, led the revival of wacky, animated trick hazards. These hazards required both accurately aimed shots and split-second timing to avoid spinning windmill blades, revolving statuary, and other careening obstacles. In the United States, National Miniature Golf Day is held yearly on the second Saturday of May. The event had its inaugural celebration on May 12, 2007, and was officially recognized and published in 2008's edition of Chase's Calendar of Events. By the 1950s the American Putt-Putt company was exporting their minigolf courses to South Africa, Australia, Japan, Korea, India, Iran, Italy, Pakistan, Argentina, Brazil, and the Eastern Bloc. Minigolf courses are found in all parts of the world, but their popularity is by far highest in the US, the UK, New Zealand, Scandinavia, and central Europe. The British Minigolf Association (BMGA) has an additional – and quite surprising – problem on their way to greater success in competitive minigolf. While the minigolf federations in mainland Europe receive annual funding from the government, in England the national sports organisation Sport England has refused to accept BMGA as its member – which means that BMGA is left without the public funding that other forms of sports enjoy. The rules of Sport England declare that only one variant of each sport can be accepted as member – and minigolf is interpreted as a variant of golf. No person is known to be earning his living by competing in minigolf. Many course owners and employees naturally earn their living by working at minigolf courses, and some of the best minigolf players earn their living from minigolf-related work, such as giving putting lessons to golf players. Many miniature golf courses also offer other forms of entertainment such as carousels, go-cart tracks, batting cages, and redemption arcades. In the US there are two organizations offering national tournaments: the Professional Putters Association and the US Pro Mini-Golf Association (USPMGA). The USPMGA represents the United States in the World Minigolfsport Federation, having been an active member since 1995. USPMGA President Robert Detwiler is also the WMF representative for North and South America. ^ Welcome to Putt Putt Fun Centers! ^ "The Illustrated London News June 8 1912". Archived from the original on 2016-03-04. Retrieved 2016-02-09. ^ "The History of Mini-Golf". Holey Moley Golf. Retrieved 13 November 2018. ^ "Minigolfpics". Web.archive.org. 2007-12-21. Archived from the original on January 14, 2013. Retrieved 2013-06-14. ^ "Minigolfpics". Web.archive.org. 2007-12-21. Archived from the original on January 16, 2013. Retrieved 2013-06-14. ^ "Minigolfpics". Web.archive.org. 2007-12-21. Archived from the original on December 21, 2007. Retrieved 2013-06-14. ^ "Belfast, Adventure Golf - The Captain's Challenge". Archived from the original on 2016-03-04. Retrieved 2016-02-09. ^ "Hohtogolf West Coast". Hohtogolf.fi. Retrieved 2013-06-14. ^ a b "Minigolf: From Summer Holidays to the Summer Olympics". Archived from the original on 2016-02-10. Retrieved 2016-02-09. 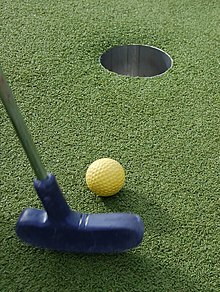 Wikimedia Commons has media related to Miniature golf.